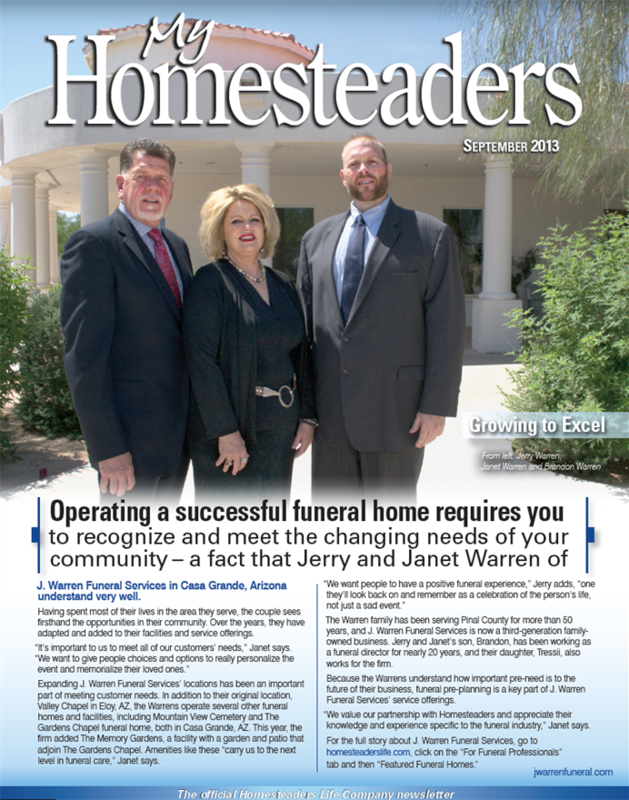 Operating a successful funeral home requires you to recognize and meet the changing needs of your community – a fact that Jerry and Janet Warren of J. Warren Funeral Services in Casa Grande, AZ understand very well. Having spent most of their lives in the area they serve, the couple sees firsthand the opportunities in their community. Over the years, they have adapted and added to their facilities and service offerings in an effort to provide choices to families. Expanding J. Warren Funeral Services’ locations has been an important part of meeting customer needs. In addition to their original location, Valley Chapel in Eloy, AZ, the Warrens operate The Gardens Chapel Cole & Maud funeral home in Casa Grande, AZ and Cole & Maud Coolidge Chapel in Coolidge, AZ, as well as the Mountain View Chapel & Crematorium in Casa Grande, AZ and the Douglass Funeral Home in Ajo, AZ. The firm has owned and operated the Mountain View Cemetery in Casa Grande, AZ since 2000. It now features a cremation garden, granite pavilion, water features and an above-ground mausoleum. The Mountain View Chapel and Crematorium is adjacent to the cemetery and is the only crematorium/cemetery combination in Pinal County. The addition of The Gardens Chapel in 2004 allowed the Warrens to better serve large-group events. The Chapel alone is large enough to accommodate 250 people. This year, the firm added The Memory Gardens, a facility with a garden and patio that adjoin The Gardens Chapel. The 1,900 square foot facility provides expanded seating capacity and catering services to provide even more opportunities for gatherings. The facility with a garden and patio is open to families for a variety of events, including wedding receptions, christenings and company dinners. All of these extra amenities allow J. Warren Funeral Services to remain competitive in the market and, at the same time, “carry us to the next level in funeral care,” Janet says. Providing families with a level of service above their expectations remains a focus for the firm. The Warren family has been serving the Pinal County community for more than 50 years. Janet’s father, who began his career in the construction business, built and then later acquired their first funeral home in 1953. Janet grew up behind the funeral home and became involved with the firm at a young age. This made it seem natural to go into the family business herself, she says. Jerry, who was born and raised in Eloy, also discovered a passion for the funeral industry. As a funeral director for the last 43 years, Jerry is a strong leader for their team. “Jerry is the face of our funeral business,” Janet says. J. Warren Funeral Services is now a third-generation family-owned business. Jerry and Janet’s son, Brandon, has been working as a funeral director in the family business for nearly 20 years. Their daughter, Tressii, also works for the firm. Even the couple’s grandchildren have started to get involved – the beginning of a fourth generation. Because the Warrens understand how important pre-need is to the future of their business, funeral pre-planning is a key part of J. Warren Funeral Services’ extensive service offerings. The firm’s partnership with Homesteaders has been a valuable asset to their pre-need program, Janet says.